Union of Burma Airways continued to do its major overhauls in England. Weeks before Dove XY-ABN was due to depart the English pilots spent much of their time buttering up the Gut-of-Sludge. Some seemed prepared to sacrifice their goolies to get a trip back to the Old Dart. Even though I took no interest in the assignment an Aussie, got the nod. 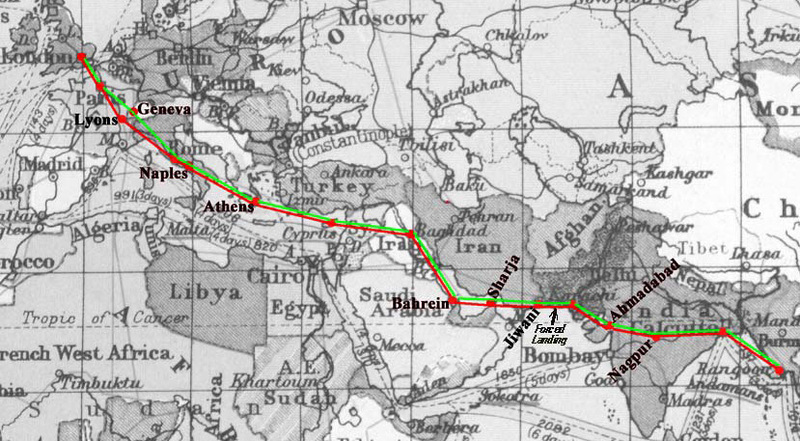 On 8 September 1952 I set a course that began that long haul. 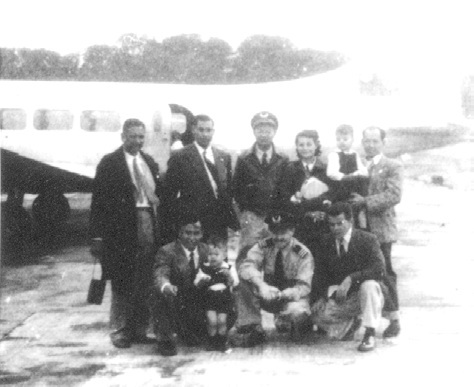 Aboard were sparks George Lewis and flight spanner Len Saldanha and seven passengers. 8 September 1952 – Red track from Burma to the United Kingdom. 22 September 1952 – Green track from the United Kingdom to Burma. The initial days brought a fare of arid lands and lonely skies. The trip should have excited me but somehow seemed mundane. To me there were but two highlights. I recall sitting on a blanket in the Baluchistan desert industriously cleaning spark plugs. My roving eyes beheld an inhospitable land notwithstanding a massive French Foreign Legion fort that filled the background. We had flown into a sandstorm after leaving Karachi and although I climbed above it sand had gotten into the carbies. With the vibration of the backfiring engines threatening to tear themselves from their mountings I had forced landed about thirty miles from Jiwani. Len Saldanha, our ground engineer, reinstalled the plugs checked the carbies and ran the engines and they purred like contented kittens! My sun-crisped passengers needed no second invitation to get aboard and applauded when I pointed the tail at the fort and blew a goodly portionof the desert through its open doors. Not a soul had ventured forth to offer succour or encouragement. dearth of humanity greeted us. Just as I visualised our bones bleaching under that searing sun a bright shining tanker roared up. We wasted no time in refuelling and took off for Sharja. The other memory comes from getting lost over France. Soon after leaving Lyons my HDI packed up and I continued the flight using the Magnetic compass. With frequent reference to our map we were doing fine until about 50 minutes from Paris we ran into heavy industrial smoke. I asked George Lewis to radio Le Bourget and advise that we were unsure of our position. Suddenly the spire of a beautiful cathedral materialised in the ghostly haze. As I circled my radio officer described it to the French gonio operator who immediately recognised it and guided us to the landing threshold of Le Bourget Airport. When I submitted my next day’s flight plan to London I asked for an incident report sheet. They accepted my flight plan but showed no interest in the incident. It seems anything that keeps a Frenchman from his Beaujolaise and cheese must be avoided at all cost. That night we visited the Aviators’ Club in Paris. It was a night to remember, and I spent an hour drooling over the splendid photographs of WW 1 flying aces. Early the next morning we arrived at our designated port of entry, London’s Bovingdon Airport, which lies about 30 miles NW of the City of London and hosted a USAF squadron during the War. There we off-loaded our passengers and backtracked the 8 miles to Leavesden where, with a sigh of relief, I handed over the Dove to the de Havilland engineers. I was thoroughly clapped out. With no autopilot and not accustomed to longitude flying my clock of Morpheus seemed confused. Then jet lag, although an insidious reality, had no designated title. On 22 September 1952 George Lewis and I climbed our Dove to 7,500 feet and headed across the English Channel. Our refurbished replacement XY-ABQ shone like a new pin, but ahead of us was a long wearisome flight. Without the excitement of new untrodden countries it proved hard to remain enthusiastic. The one moment of excitement was at Paris where I was rerouted to Geneva, Switzerland, as the Lyons refueller’s had called a snap strike - seemed I was back in my native land. The beautiful Shwe Dagon Pagoda appeared ahead on the 29 and we were home! A small ray that should have been brightness proved otherwise. Captain Tizzy had gone to plague another’s workplace and I felt abandoned.